The Tower simulator has been built to fit all requirements, from the dynamically developing airport requiring a simulator to train controllers to cope with challenging traffic situations set on a large LCD array up to well established schools looking to upgrade to full 360° curved screen projection with edge blending. When we set out to create ATCOsim 3D Tower we knew it had to look more realistic than current products and be visually exquisite. We wanted for everyone to be able to afford it and easily update and maintain it. So we created a modular system which uses the powerful DirectX 11 engine that scales with hardware performance. 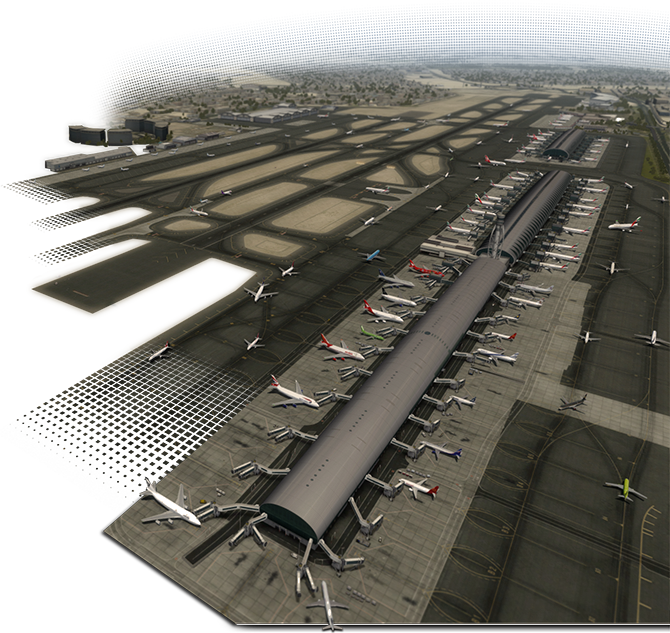 That means you get good-looking day-night transitions through the lighting and shadow system, 4k high resolution textures, over 5000 aircraft liveries on 200 aircraft types even on the least expensive hardware while maintaining smooth image rate. And you get reflective water, HDR processing and more as you add stronger hardware. 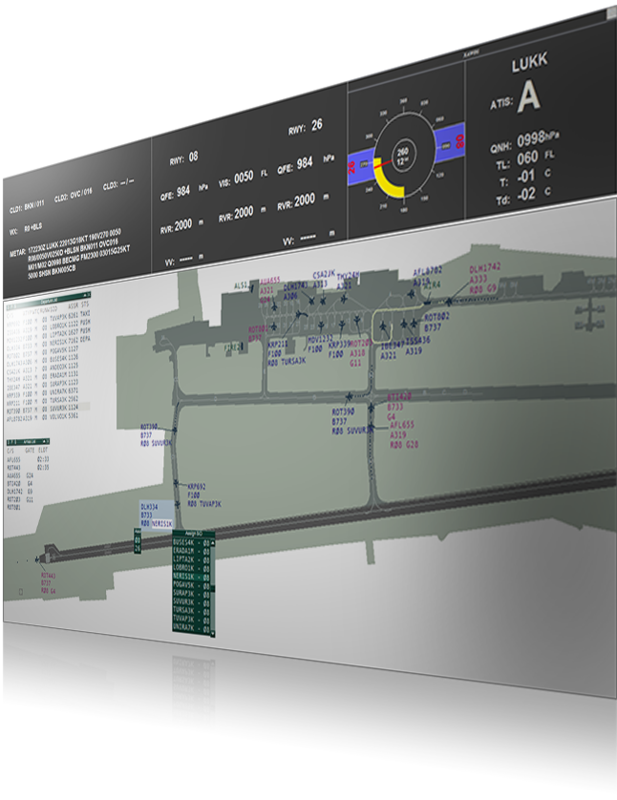 The interfaces for supervisors and pseudo-pilots has been designed to be intuitive and easy to use while giving access to powerful simulator commands like ground movement automation, METAR input and emergencies. For one session you can configure the simulator aircraft tag to hold the most used commands with natural looking icons while for the next session you can reconfigure the tag to hold much more information and input fields, depending on the scenario’s requirements. A-SMGCS displays are available for the ground and tower controller position. These are based around the Integrated Tower Working Position system in which all the information that is needed is available in a single screen in a natural environment. 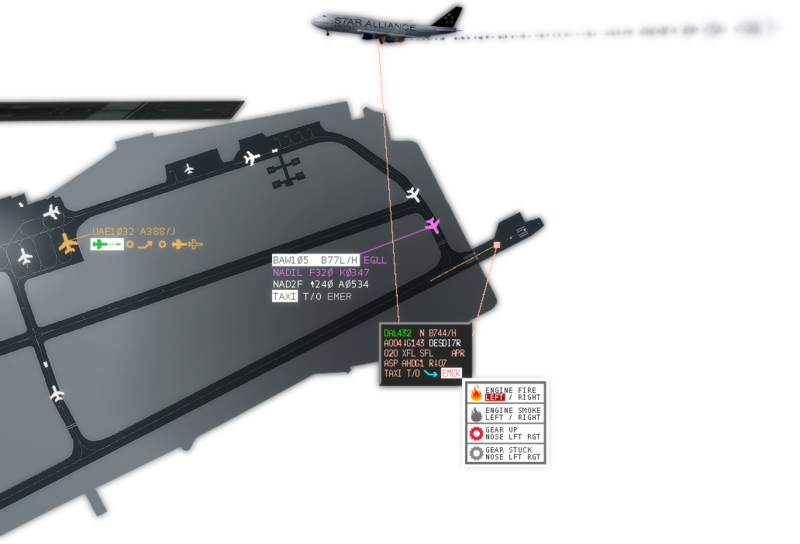 You are able to read instant meteorological information including Runway Visual Range at multiple points on the runway, authentic wind rose and even ATIS audio message generation. They accurately reflect what is seen in the simulator and the wind affects smoke and fire direction in case of emergencies accordingly. The A-SMGCS provides all required information at a glance and inputs can be made with just a click. Or two. It is based around the same logic that the pseudo-pilot system employs using a customizable tag for the most crucial information and inputs and keeping the screen uncluttered. Everything else is moved to the lists which provide advanced planning tools. Extended coordination between Tower and Approach Radar for departure clearance instructions such as SID, heading or initial climb altitude, all are close by to better assist the controller. We found that radar simulator products quickly became archaic and did not keep up with the quickly changing pace of Air Traffic Management systems currently in use. We designed a deeply customizable solution which can be extended via a plug in architecture. The clever thing about this is that it provides a stable core that will be rock solid and never crash while the plugin provides the look and feel and the tools available in your native operational software. So when students progress from the simulator to on-the-job training they will already know all the available tools. We deeply believe that the software should adapt to your needs, not you to the software’s requirements. Right from installation the tools provided rival the leading ATM solutions available. So if you have a cutting edge new ATM system you can have the same tools in the simulator too. 4D trajectory calculation is based on aircraft performance and will drive the arrival sequence manager, the Medium Term Conflict Detection (MTCD) and the non-radar procedural control environment. Safety nets available include Short Term Conflict Alarm (STCA) with pre-warning, Minimum Safe Altitude Warning (MSAW), Route Adherence Monitoring (RAM) and cleared altitude bust alerting. The coordination system will provide you with exit and entry level coordination as well as Direct or rerouting coordination. An extensive emulation of radar coverage is included. Radar antenna will have accurate blind spots and ranges, and are precise even if the antenna is a PSR or a SSR radar. S-mode receivers are completely integrated too. The controller working position display is fully ready for the strip-less revolution and the customizable tags and lists are extremely powerful. You can configure the tags to have the bare minimum for an uncluttered display or fill it with every information you can think of and the superior tag management system will make sure the display still remains uncluttered and clear. And you can do all these changes on-the-fly yourself. We built on the revolution in Voice over IP technology to deliver the most flexible voice communication system ever built for a simulator. This allowed us to do things previously not thought possible. Since the simulator platform has been designed for integrated remote training over the internet the communication system is able to handle low bandwidth connections with low latency. The familiar User Interface which can be displayed on a touch screen provides access to both frequency switching and monitoring, and controller intercom coordination access. We believe trainees should train on an environment which encompasses all tasks of an active controller, including the constant phone coordination. 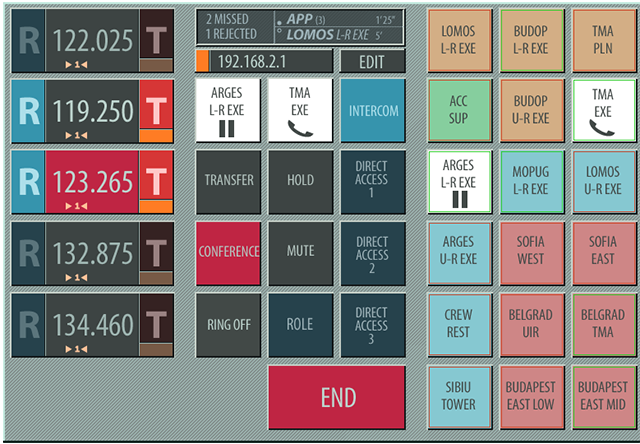 All required features of operational intercom systems, such as conference, reroute call, and multiple lines, are available. And to make progress report and analysis easier all communication is recorded together with the radar log. Our efficient format can store hundreds of hours of log complete with audio in only a couple of hundred Megabytes. You will be able to archive students’ training for many years and recall it for recurrent training overview. We think scenario design process should be easy. From a single command interface you can either start a new scenario for tower, start adding aircraft and vehicles --- which you could see out the window in the simulator --- and be done in a couple of minutes. 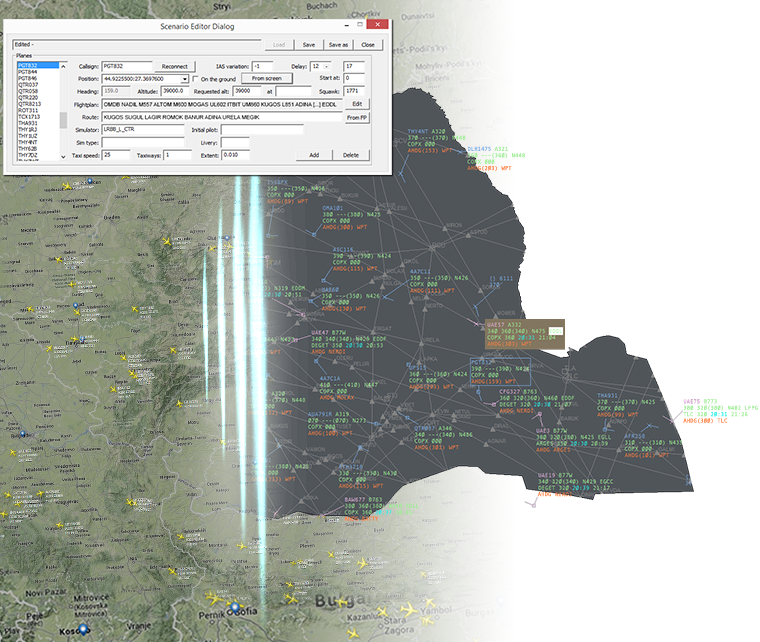 Or you can connect to actual instant traffic situation via an ADS-B receiver anywhere in the world, save a snapshot, and create a simulation scenario building on it. Either way you will not spend hours creating an exercise and fine tuning it. Instead, spend that time analyzing logs from last night’s training to find the weak spots. In the end, less time spent on creating scenarios is more time spent on student training. If during multiple runs of the same exercise you wish to slightly randomize the exercise, or if you want to try a specific example in your scenario, you don’t have to stop your exercise, take some time off to modify then restart. You can just adjust it on the fly, move some planes around, remove some while adding a few more, change the timing then proceed with the exercise. We know that quality and ease of use rests on the small details therefore we have focused on each detail to make installation and implementation quick, instructor accommodation seamless and training better in every way. © ATCOsim Investment. All rights reserved.